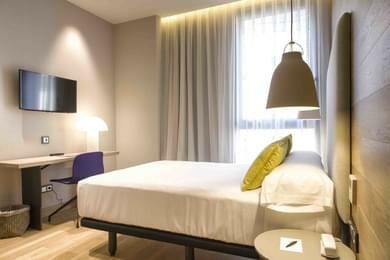 Deluxe Room with double bed and a magnificent bathroom. Exterior and fully equipped with free wifi, AC, safe and tastefully decorated. 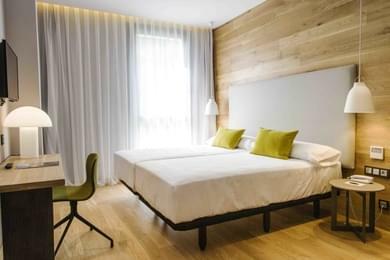 Double rooms, with two single beds - 1.05 - with two long (2.00 meters or 2.10 specially designed for athletes of certain sports). All rooms are exterior, with AC, flat screen TV, bathroom, free Wifi, safe and a multitude of details. 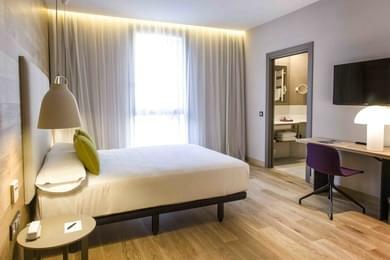 Double rooms, with one large bed -1.50- and two long (2.00 meters or 2.10 specially designed for athletes of certain sports). All rooms are exterior, with AC, flat screen TV, bathroom, free Wifi, safe and a multitude of details. 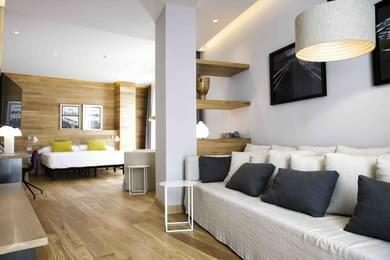 The Zenit Hotel San Sebastián has 6 rooms prepared especially for families travelling with children or very small groups. The distribution is 2 rooms ( 2 beds of 1.05 and 1 double bed of 1.50 meters ) with two bathrooms and a room door isolating the other. All rooms are exterior and fully equipped. Modern single room which have all kinds of technological advances, are exterior and have beds 2.00 or 2.10 meters long. 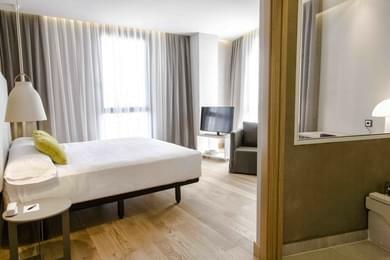 The Zenit Hotel San Sebastián has 4 junior suites. Exterior room with double bed and a magnificent bathroom, free wifi, AC, safe and tastefully decorated.